The Honourable Marie-Claude Bibeau was elected as the Member of Parliament for Compton—Stanstead in October 2015. She has served as a minister since 2015, and is currently the Minister of Agriculture and Agri-Food. 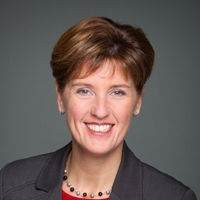 Minister Bibeau began her career at the Canadian International Development Agency, and went on postings to Morocco and Benin. After settling down with her family in Quebec’s Eastern Townships, she became a successful businesswoman and was actively involved in her community. In her current role, Minister Bibeau’s overarching goal is to support the agricultural sector in a way that allows it to be a leader in job creation and innovation. Knowing that Canada’s farmers, ranchers and food processors are the foundation of our food sector, she will help Canada’s agriculture sector be more innovative, safer, and stronger.